Really Reasonable Ribbon Partner Blog Hop with Sparkle N Sprinkle! I also embossed the sentiment using some Black Opaque Embossing Powder from Sparkle N Sprinkle. They have a huge variety of embossing powders, glitter, flocking, etc. so make sure you check them out! Now it's time for you to hop on over to Donna Maligno's Blog, but make sure you comment along the way for your chance to win fabulous prizes from Really Reasonable Ribbon AND Sparkle N Sprinkle! Thank you so much for stopping by and enjoy the rest of your weekend! I come have arrived here from the Really Reasonable Ribbon Ramblings and rushing to sign up. Today is a very nice sunny day. Your map coincides with my spring mood. It blends with the sun, which now fall on the computer. Yes, and it is incredibly beautiful rainbow. Kerri ,I love the bunnys there so....cute.Love your cards it's so spring colour.Love the details of this yellow ribbon. What abeautiful creation for Easter adore the basket.Just ashame we havent the weather here to go with it! How cute is this. Love the basket, it's soooo cute! Wow! What a beautiful project! Love the basket and card you created, Kerri! Owh, this basket and card are fantastic. I love the papers you've used. Your basket is darling! All those soft colors make me think of spring and I am oh so ready for spring! Such a cute Easter set! So happy and full of fun colors! I like that you used the same bunny in different poses to complete the set :>) Cute basket! What an incredibly sweet project, Kerri! The cards are simply darling! Love the colors used! How pretty!! The colors are so gorgeous throughout! I have fallen in love with that ribbon too! Great Easter card and tote!! Very nice card and basket. Inviting colors and ribon. Just darling! Thanks for sharing! I love the spring colors on your basket and choice of ribbon. The basket is beautiful. Really cute basket. Don't you love that tulip bunny stamp? What a lovely card and basket set. Love the colors. Thanks for sharing and inspiring. This is fabulous, Kerri! Love your wonderful Easter basket. Great to see you again!! How stinkin cute is this Kerri!!!!! Love the basket! The colors are so spring like...very nicely done. Kerri, Fantastic projects! Love the basket and the image you chose for both. Wonderful coloring. That diamond ribbon is so perfect for your Easter creations. Thanks so much for sharing with all of us. Kerri, your basket is adorable! love the colors and perfect for Easter! Thanks for sharing. Kerri, Your basket and the card are just so cute. Love them both. What a pretty set have you made Kerri, so sweet and so wonderful! What a great card and basket... I love how you used the ribbon on the handle and the bow too!!! 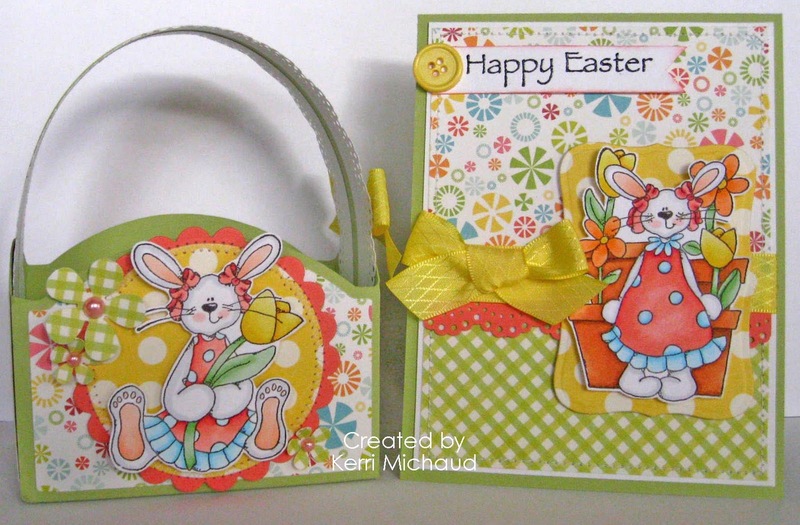 What a terrific little basket and card set Kerri! So cute! How cute is that. It feels like Spring! So cute!!! The colors are very Spring-like... go away Winter and come on Spring! What beautiful ribbons and equally beautiful and cute card and basket. A great set for the upcoming holiday. Oh my, Kerri!! These are just sooo adorable! Love that little basket! AMAZING! :) Hugs!! What a gorgeous basket! I love the way you have used the ribbon!Thank you for this opportunity to win a prize! I hope I win! I hope I win! I hope I win! What a lovely basket...for some lucky bunny !!! Your basket is darling! I like the ribbon on the handle...thanks. I love your Easter Card and Basket. Just adorable. The rabbit is just too cute. Your card and basket are absolutely adorable! Thanks for sharing! Great card and basket! The colors in the paper are amazing! Ok, bring on the Easter. Love that bunny and basket too! Eeek, this is adorable! I love it and Easter will be upon us before we know it! Adorable basket and card! Love the images and the spring colors! Oh how sweet! I love your basket and card to match!! This would make an awesome Easter gift!! Those bunnies are just adorable!! Both the card and basket are lovely, the perfect Easter gift. Love the way you used the ribbon on the basket. Precious little Easter card. Love it! Hurry up spring! Gorgeous basket and the happy bunny is so cute. Gorgeous set fo r Easter! 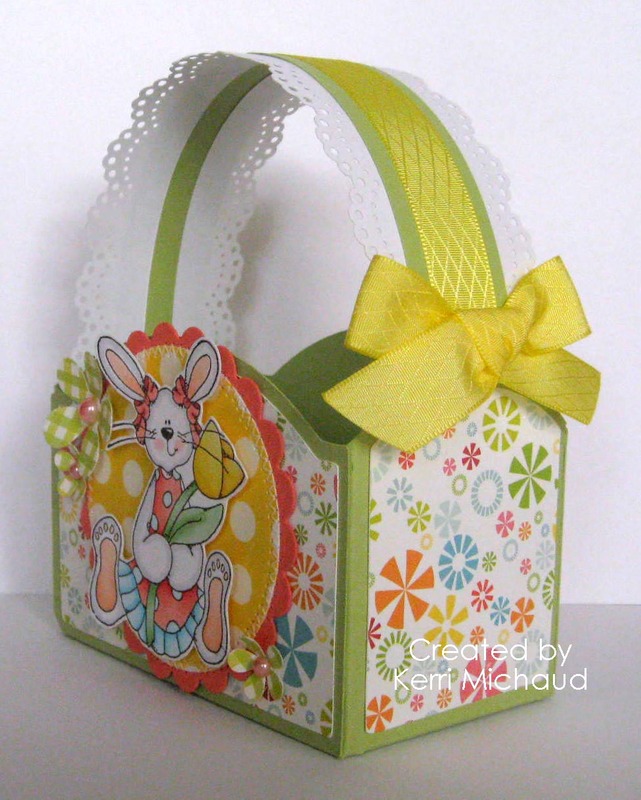 I love the cute immage and the basket with a bright ribbon nd this lovely card. So cute and many ideas. Makes me what to bounce around and right into Spring and Easter. Thanks. Gorgeous set. Thanks for sharing. what an adorable Easter ensemble! so sweet , bright and cheery! The bunny is darling! I'll have to add it to my wish list. Your set is so sweet! I love the citrus colours for spring to go with the pretty ribbon. Your bunnies are adorable. OMG! That is the cutest thing I've seen. Thank you for sharing! So stinkin CUTE! Fabulous tote and card Kerri. Kerry is the first time i visit your Blog, i am comming follow the blog hop, and have to say that i´am in love of your basket, is really adorable! WoW WoW WOW!! I love your creations, they are so amazing! This is lovely - I especially like the basket- it's just begging to be filled with oodles of chocolate eggs! !